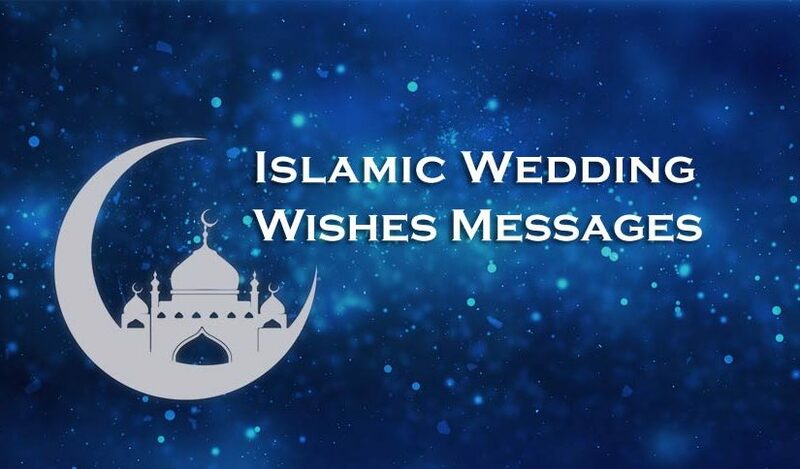 Islamic Wedding Wishes : Sending wedding wishes, messages and duas to a newly married couple is a common thing for all of us. But sometimes, we can’t clearly disclose whatever we really want to say to congratulate a Muslim couple in a religious way. 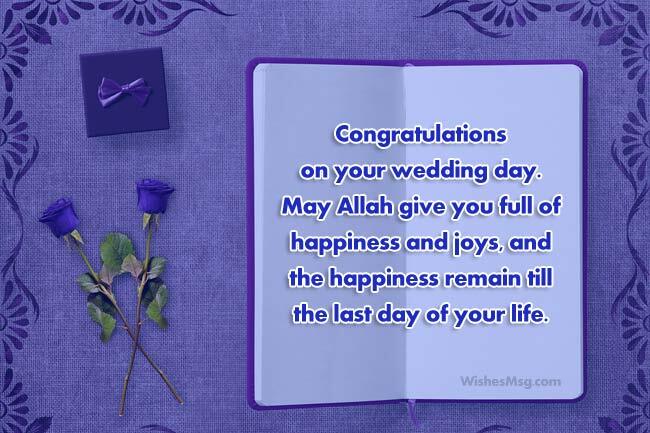 To help you wording your blessings and greetings to a newly married Muslim couple here we provide some Islamic wedding wishes. However, by these Islamic Wedding Wishes, you can expose what you really want to say. 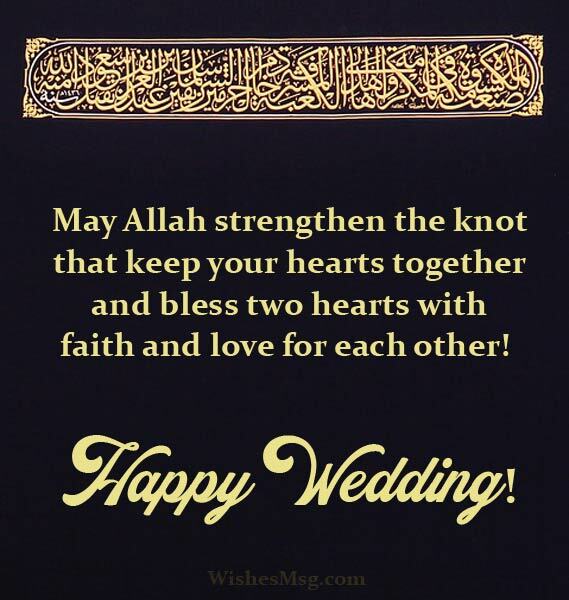 Send your good vibes and prayers for a happy marriage to any of your Muslim friend, brother, sister, family member, relative, cousin or colleagues. 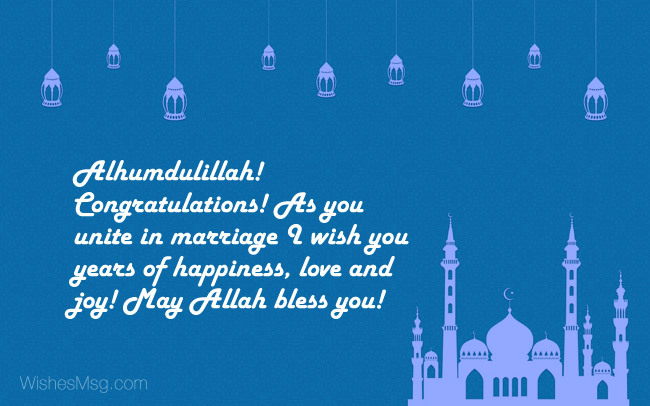 So now, writing Islamic wedding greetings could be more easy for you and it doesn’t waste your valuable time much. The journey you two are starting today, may never end. May your love for each other always remain strong like this. The day you two had been waiting for has come to you at last. Make the most of it and enjoy this special wedding day. It’s great to know that you guys are getting married. I always knew you guys would end up being with each other. Wish you guys a beautiful married life. Congratulations to you guys! Have a great wedding day full of enjoyment and precious moments. And stay together forever! Allah created a soul at first and then he divided it in two. So that he can join them again together in marriage! You two complete each other! Oh Allah, bless them. Bless them with untold happiness and joy. They may love each other and cherish each other forever. May Allah strengthen the knot that keeps your hearts together and blesses two hearts with faith and love for each other! Happy wedding! May this marriage last as long as eternity and bring endless joy to everyone close to these beautiful souls. May Allah shower you two with everlasting peace and happiness! All praises be to Allah that he brought two pure hearts close to each other and tied them in a holy knot of marriage. May his blessings be with you always! Mas Allah! You’re the perfect couple I have ever seen! Both of you are like soul mates for each other and together you are so strong that no one can defeat you. Allah! Keep them in your blessings! Mas Allah! You are both the gift of Allah. Always be honest and loyal. I hope you stay together on this wonderful journey of love. Congratulations! Assalamualaikum! After a long time finally, both of you decided to get each other for the lifetime. Allah! You are loving and merciful. Put love in their heart. Happy wedding! Alhumdulillah! Congratulations! As you unite in marriage I wish you years of happiness, love, and joy! May Allah bless you! My beloved bride and groom! Congratulations on your wedding! You know love is the basis of all happiness, keep loving each other! May Allah always guide you on the right way and help you to take the right decisions, always follow the instruction of the holy Quran and make your life peaceful and easy. May God bless your marriage and keep it safe. Now you start this new journey in your life. Subhan Allah! Hope you‘ll always give each other unconditional love. Wishing you the best luck and the most beautiful life ahead! Dear! To getting married is amazing. But it’s not all about fun and enjoying, rather a great responsibility. As a Muslim it’s Sunnah! Nikah Mubarak! Oh Allah! You are loving. Give this loving couple the ability to stay together! Wishing you the happiest conjugal life. May Allah bless you! You look so happy on your wedding. Alhamdulillah! This happiness is the indication of your love and the blessing of Allah! Wishing you a very happy beginning of your new life. Mash Allah! It looks like you both are made for each other. May Allah make you the world’s best beautiful couple! Best wishes on your wedding! Without trust, there can be no love! So, keep trust in each other and fell the happiness of life. Go ahead by following the way of the Holy Quran. Our prayer is always with you. Mubarak of Weeding! Nikah Mubarak friend! You have started a new life, this is totally a new phase of your life. Stay honest always, Allah will help you in every step! Dear! Mubarak on your special day! Always try to feel each other’s heart and soul. Always support and understand each other. And never let go of this love of your life. May Allah bless you! By the marriage you get the recognition of society and family. You also perform a Sunnah! There may be ups and downs in life, make sure never stop holding each other‘s hands for the lifetime. Best wishes! Congratulations on your wedding day. May Allah give you full of happiness and joys, and the happiness remain until the last day of your life. Today two souls of yours have turned into one. MashAllah! Make the bonding tighter. My heartily Mubarak to you on your special day! May your life be filled with light. Dear, the most important part of your life has already started. Alhamdulillah! Always show respect to each other and never leave even when life becomes more painful. Nikah Mubarak! Mubarak on the special occasion! You know, Trust is the main basis of love and happiness. May you always hold on to each other with trust and faith. Allah always with you! Mubarak on your wedding! You have a bright future. Face life together and make the promise that you will never leave each other. We all pray for your happy life. To the special couple who always stood by each other in every situation and loved each other, may your love grow more and more! Happy wedding! Happy Wedding! wishing you an amazing start to the wonderful life together. May Allah show you guys the right path in life. No couple is as perfect as you two. Congratulations on your wedding. Allah created you too just for each other. Many years will go by but only the strongest of bonds shall stay intact. I wish you two have the best wedding. May your bond grow stronger. An Islamic wedding is the best reward for a pair who is truly and deeply in love with each other! I wish you two long-lasting and fruitful marriage! There is nothing in this world so pleasing as seeing a happy Muslim couple. I hope to see the same spark of joy in your eyes forever! Happy wedding! My prayers are always with you son. May Allah bestow his blessings on you and your wife. You were raised to be a devoted Muslim and that is exactly who you are now. May your married life be full of joy and happiness. As a Muslim, you should respect your wife and love her immensely. I wish you a happy married life son. May Allah bless your marriage and keep you united till the end of the time. Happy wedding, my dear son! We are blessed that how much she cares for you and makes you happy. Congratulations you two and welcome! You brought me happiness from the day you were born till now. I am happy to see you getting married to such a devoted young man. I thank Allah for everything! May Allah grant you and your husband a lifetime of beautiful and joyous moments. The memories you make, treasure them forever! Have a happy wedding. I have always dreamt of this very day for you ever since you were a little girl. I have also prayed that you find your perfect match in life. May Allah bless you. It was Allah’s ever so generous gift that we had you as a daughter. Now its time for us to wish you a peaceful and blissful married life ahead! You were raised as an obedient Muslim and now you’re joining a Muslim family as a proud wife to your husband and a precious daughter to his parents! Happy wedding! Dear Friend, I congratulate you two and wish a happy and safe beginning of a new chapter. May Allah keep you away from every difficulty in life. As candles illuminate, I wish you guys illuminate each other’s life. Never give up on each other. Stay together. Wish you a happy married life. Now that you are married, fill your life with the proper amount of love, compensation, consideration and understanding. Never forget to thank Allah for everything! May this sacred marriage of you may last forever. Have a happy married life, my friend. May this wedding open the door that welcomes a thousand blessings from Allah. Have a beautiful married life. Happy Wedding! May life be filled with lots of love, care, fun, and adventure. Mubarak on this happy moment! May Allah bless you! Alhamdulillah! After a long waiting, today your dream comes true. Mubarak to you! May your marriage be strong and bright. Wishing the best things in life for you. May Allah bless you! 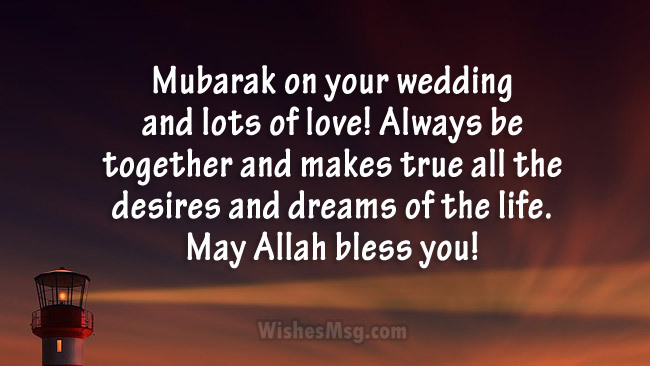 Mubarak on your wedding and lots of love! Always be together and makes true all the desires and dreams of life. May Allah bless you! Nikah Mubarak! Make your nest with love and trust. May your hearts be always near both in good and bad times, Oh my Lord! Make the couple world’s most beautiful couple and the inspiration of others! Mubarak! Here wishing you a fabulous start to the wonderful life together. Oh, Allah! Show them the right path of life. Weeding Mubarak both of you! Texting is the best way to express one’s speculation about a matter. It is an easy way to show your care about anyone or any matter. But most of the cases regarding lacking time and unconsciousness of our mind texting lost its sweetness. But we made it easy for you.